We know the traditional version of the upside-down cake in which he wants to star in the pineapple, which is always particularly impressive even when cut & cooked. Bananas, on the contrary, do not have such a "shine", but cutting them down and placing them in a row on the base of a refractory pot in honey can become just as attractive and beautiful. My opinion; Another taste, with the presence of honey! Yours! 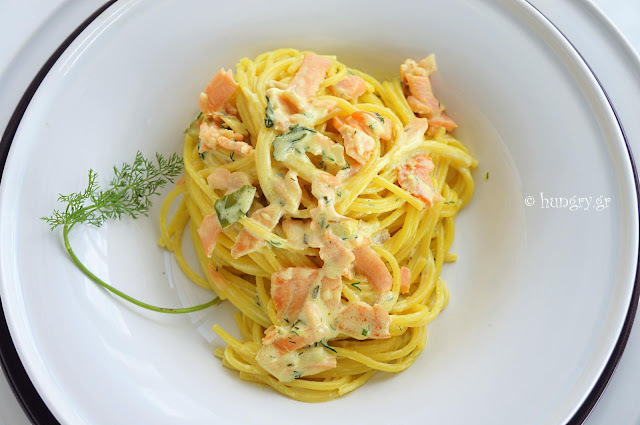 Spaghetti bathed with a white creamy sauce -we adore- combined with smoked salmon to give them their wonderful smoky taste and plenty of green onion and chives. Of course (!) Vodka, which so much like in salmon, will help in the taste of this dish. What else to say, to say that white pasta, pasta with white sauce, combined with some seafood, is one of our favorite macaroni. Although you are unable to make this combination make this macaroni and enjoy it! Do we like Cabbage Rolls but we do not have time to wrap them one by one? 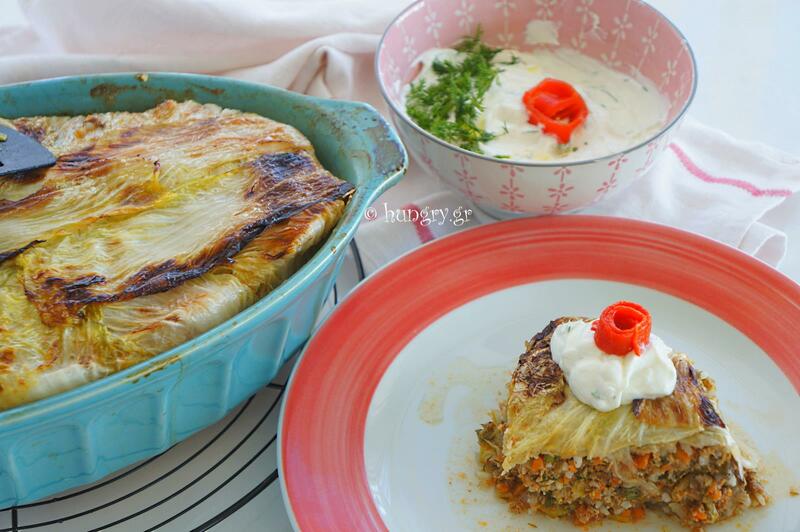 We prepare quickly and easily a cabbage pie, which is just as delicious but easier and more impressive. 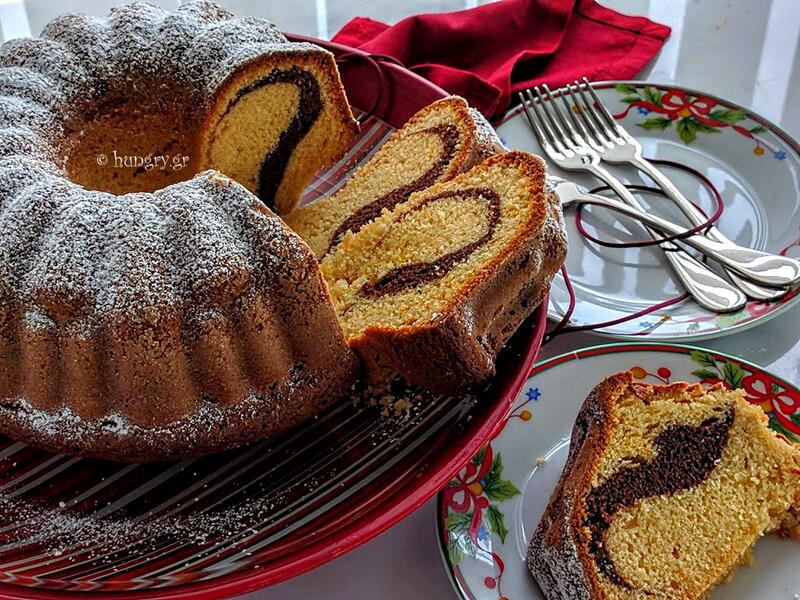 Vanilla Cake & Chocolate, a real Bundt Cake robust, solid, tough, heavy, liquid cake that has nothing to do with fluffy, airy, ethereal cakes, but it is wonderful and you will allow me, for excitement, to offer you with many praise. 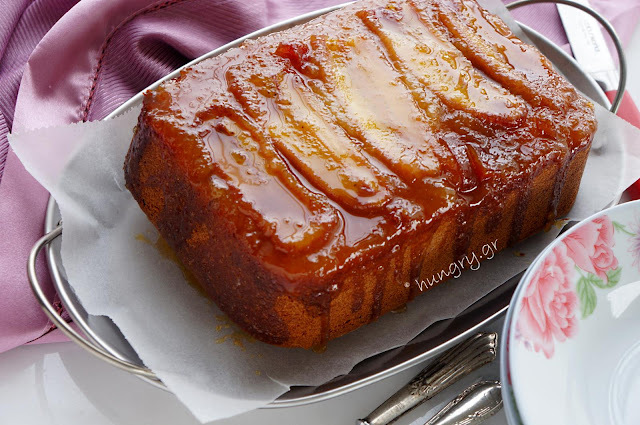 Fine, infused and tender, this golden cake is the simplicity at its best. 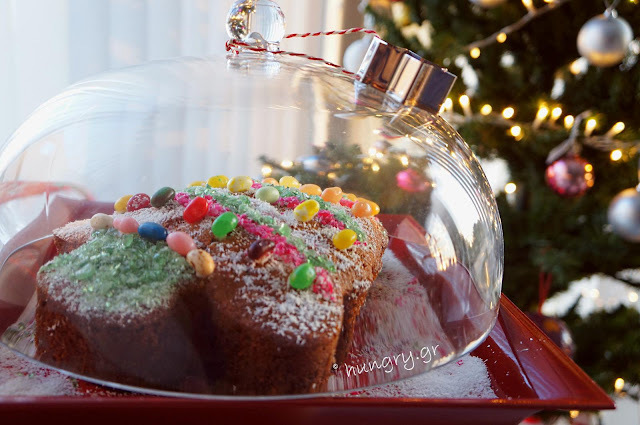 Baked in a Bundt form is just as good to serve it with fresh fruit, ice cream, whatever you like it or just it yourself, sprinkled with sugar as much as you like. 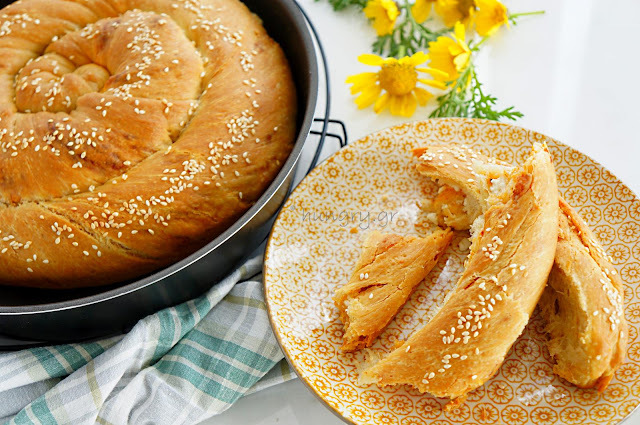 Traditional Cheese bread/Cheese pie with a spiral-shaped slice, combining the shape of a circle and its dynamic movement, symbolizes Time. As part of the smooth endless line it also symbolizes the development, continuity, pace of breathing and life itself. It becomes our own consciousness to accept the turns, the changes and the evolution of life. Health, Love, Happiness to Everyone! Merry Christmas and Happy Holidays to all our friends, wishing you health, peace and happiness! The days at the beginning of November, in the city we live in, are this year very beautiful, mild, sunny, the vegetables at their best and all-weather or greenhouse aubergines are everywhere. 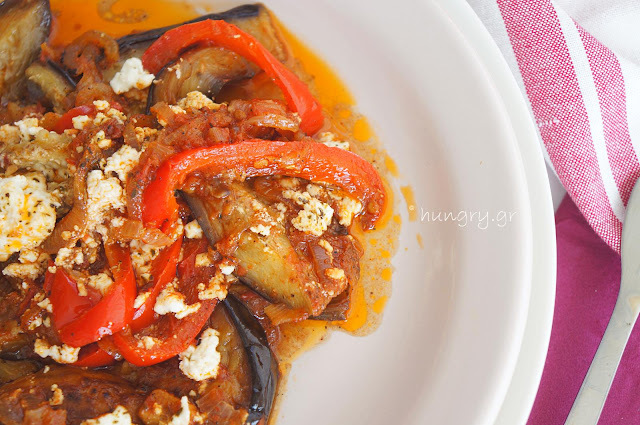 Did you want a super easy and super tasty oily food, with the presence of eggplant predominantly? Follow the steps of the recipe and make this dish that we are sure you will enjoy! I do not de-bitter Aubergines for many years. I think this process is not necessary and taste is not improving. The truth is that over time the varieties have changed, de-bitter would be much more important than it is now. Salt helps aubergines to eliminate their metallic taste, as well as part of their juices and nothing beyond that. It is more important to choose from the market aubergines without many spores, which are tasteless and hard and change their taste. It's been already nine years since it was published here for the first time this boiled cake or casserole cake, as is often said. It saw the light under the title: "Chocolate Cake, Juicy" and excited those who they enjoyed the 1st book of the Kitchen Stories «Desserts». 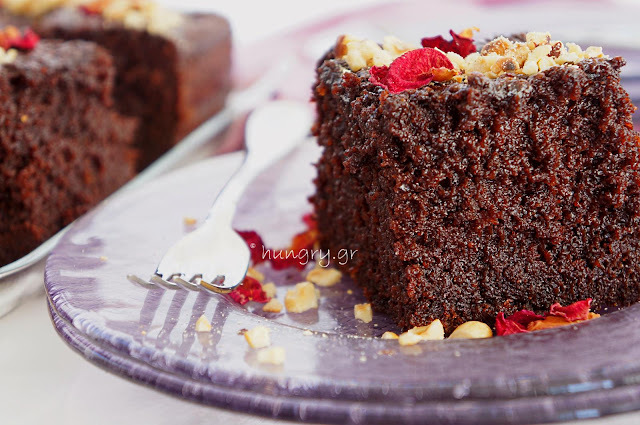 Today we suggest another similar version of the same cake, reinforced with some modifications/improvements through the experience and knowledge of so many years, with the addition of strong coffee in its highly chocolate syrup for the presence of cocoa and roasted hazelnut in serving, which is so perfectly combined with chocolate. It became an incredibly fluffy & juicy chocolate cake -a foam cake- perfectly soaked with cocoa syrup, similar to the previous you so loved! Follow the detailed steps of preparing it and discover the little secrets that distinguish it from the package of similar proposals. Lemons and limes combine to create a fantastic flavor and a beautiful color and clarity to marmalade to the stretch onto our bread and biscuits or use it in other sweet concoctions in our Kitchen, as cakes, tartes, tortes, refrigerator sweets, sweet pies etc… At the time when lemons are in abundance we make and fill jams with lemon marmalade, where many of these become gifts for friends. 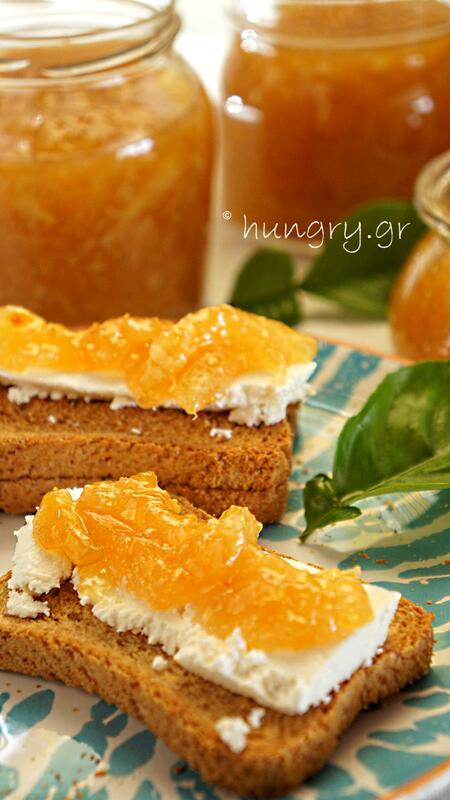 Lemons, high in pectin and acid, make a great marmalade although the actual flavor of fruit and its color varies. We use only three ingredients to make this marmalade. Lemons, sugar and water. 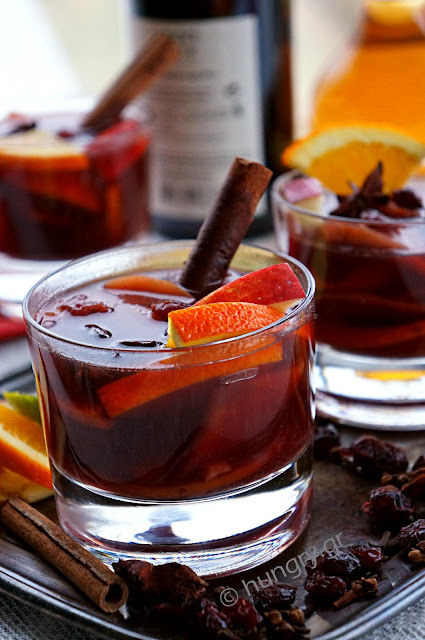 Without having to add pectin or other perfumes. Although the recipe is simple, it takes time to carry out, but the end result is worth it! Ή στη Φόρμα Επικοινωνίας λίγο πιο κάτω. Ή στη Φόρμα Επικοινωνίας ακριβώς από κάτω. © hungry.gr . Powered by Blogger.